An Olive Midi Dress for Mid October. I have no idea how Tuesday or the middle of October sneaked up on me but here we are, October 18th, hard to believe it. It is my brother's birthday today to so Happy Birthday to him! What else is hard to believe?! Warm, mid 70s temperatures, a warm sun and even humidity. In the middle of October, in Michigan!?! Yep. I am still making the most of Summer Dresses and Open-Toe Sandals, like today. 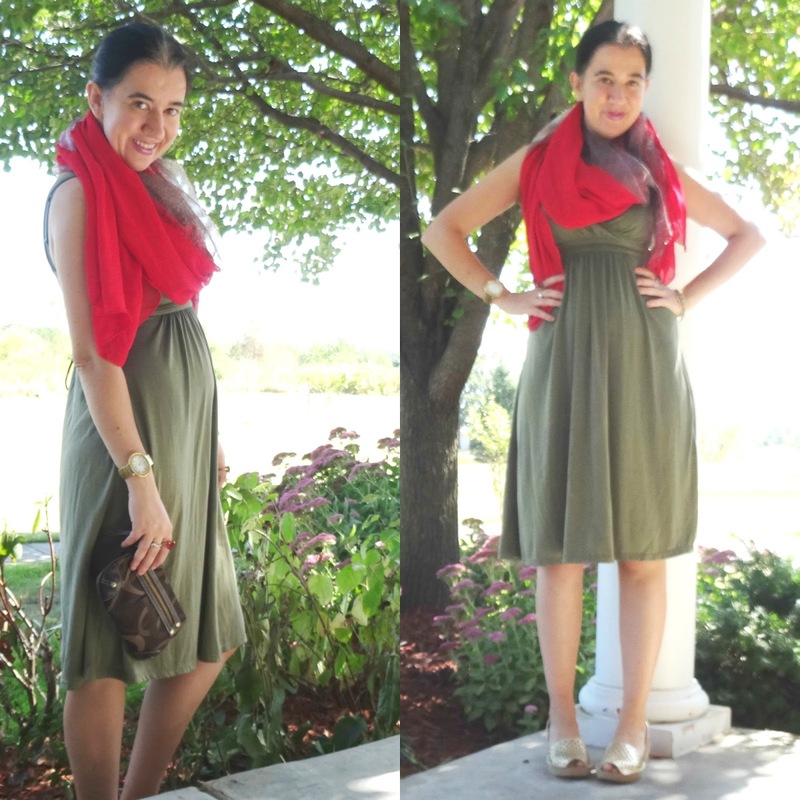 You might remember this Cozy Olive Dress from earlier this Summer. Then, I styled it with my Navy Nautical Floppy Hat. Today, trying to Fall-ify it a little bit, I added a Red+Leopard Scarf all fluffed around my neck and put my hair in a bun. I went with a Gold Watch, Dainty Gold Chain Bracelets and Rings and no other jewelry, since I wanted the scarf to be the main star over the dress. I love how the Gold Watch (borrowed from my mamma) matches the Gold Perforated Wedges, beautifully. And this scarf - I love it. It is big, light, airy and textured. The bright red part is a light knit-like material and the small-patterned leopard part is in a very thin chiffon material. The scarf also has gold little beads hanging from the red edges. Olive Green Faux Wrap, Empire Waist, Cotton Midi Dress: Wal Mart (very similar w/ pockets! HugeSteal), (gorgeous option w/ butterflies, Steal, love this), (similar retro style, Fantastic Deal), (fitted w/ mock neckline, Great Deal, my Favorite), (similar), (similar, Splurge). Red Knit & Leopard Light Chiffon Oversized Scarf: c/o Local Store in Albania (fun inifinity option Steal,), (similar, Splurge, love this), (similar gorgeous option, Huge Splurge, my Favorite). Chocolate Brown Logo "Coach" Wristlet Clutch: Coach (very similar, comes in 3 colors, Steal), (fun dark floral option, Great Deal, my Favorite), (similar in solid cognac/saddle, love this). Mauve Shimmery Lipstick: L'Oreal Colour Riche in Saucy Mauve (identical, Steal, love this), (similar, small Splurge, love this), (similar, Splurge). Gold Stretchy Chain w/ Large Oval Face: Avon (Borrowed from my Mom) (similar, my Favorite), (similar, Splurge, love this). Gold Tone Ring w/ Oval Shaped Teal Semi-Precious Stone: Express (similar round option, Steal, my Favorite), (similar rectangle option, Great Deal), (similar gorgeous option, Splurge, love this). Gold Tone Ring w/ Rectangle Shaped Red Semi-Precious Stone: Express (similar, Steal, love this), (similar, fun modern option, Great Deal, my Favorite), (similar, Splurge). Gold Soft Leather Perforated Peep-Toe Sandals w/ low Cork Wedges: Kenneth Cole (almost identical, huge Steal), (similar, Steal, love these), (similar closed-toe option, on Huge Sale, my Favorite), (dressy option, Splurge).